Global Warming has raised a global concern on climate change. Start to limit the energy uses from the existing buildings which comprise almost 30% of the total energy uses in modern countries. Greening the existing buildings [GEB] is the most cost effective and easy way out to achieve a total energy savings in a range of 40%-60%. This high energy savings will contribute to carbon reduction in the range of 20%-30%. 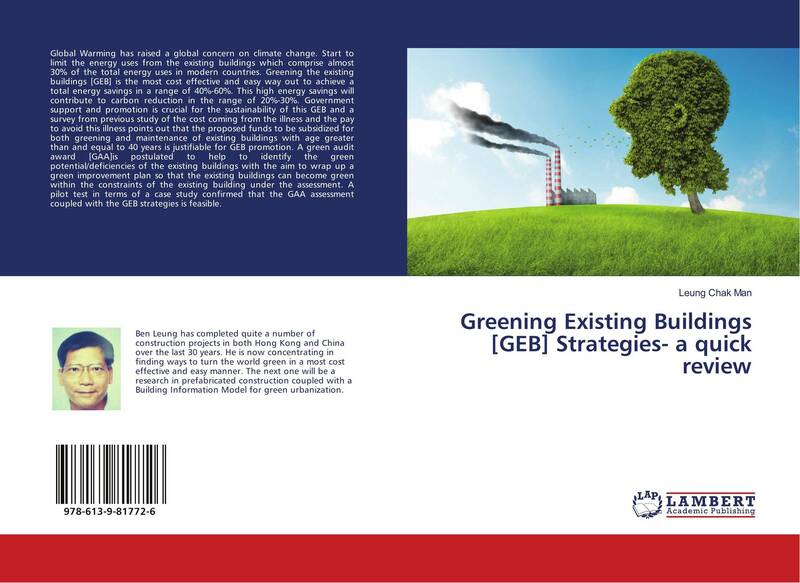 Government support and promotion is crucial for the sustainability of this GEB and a survey from previous study of the cost coming from the illness and the pay to avoid this illness points out that the proposed funds to be subsidized for both greening and maintenance of existing buildings with age greater than and equal to 40 years is justifiable for GEB promotion. A green audit award [GAA]is postulated to help to identify the green potential/deficiencies of the existing buildings with the aim to wrap up a green improvement plan so that the existing buildings can become green within the constraints of the existing building under the assessment. A pilot test in terms of a case study confirmed that the GAA assessment coupled with the GEB strategies is feasible.